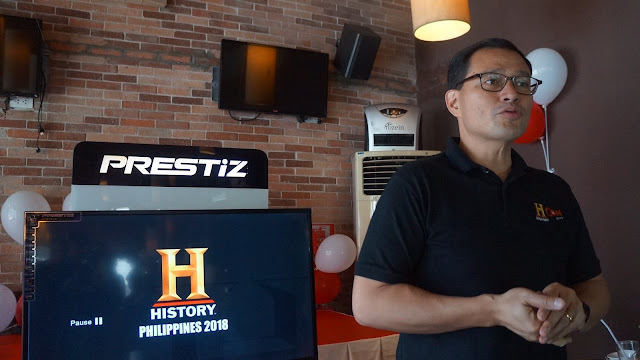 The History Con 2018 highlights and attractions are just too good to miss that the organizers of the event, A+E Networks led by Jacque Ruby, has conducted a bloggers event to announce the upcoming celebrities to grace the event, the all-time favorite and new attractions, the Guinness attempts, and a lot more. You should not miss the 3rd run of History Con as it promises to be SUPER, compared to last year which was BIGGER, BOLDER AND BETTER. The event ahs been announcing celebrity line-ups from their previous press releases posted on Wazzup Pilipinas since we are among their media partners, but we learned quite a lot of exciting plans and attractions at the bloggers event held on July 23 at Gerry's Grill Tomas Morato - same place where they've been holding the previous bloggers conference for History Con. And why hold a conference for bloggers when there's going to be a presscon on the first day of the event too? Because bloggers could easily spread the news at SUPER speeds unlike most trad media. However, a few of them are gaining momentum by already publishing the news as it happens via Facebook Live or posing immediately at their online counterpart and social media pages. On August 10 would be the day when the presscon would have these celebrity guests, both local and foreign, and an opportunity for interviews with the up-close and personal. That is the most exciting part since we get to ask our own questions and feature them exclusively on Wazzup Pilipinas. We would like to thank Jacque Ruby for providing a more generous lunch for the blogegrs complete with dessert and coffee. He allowed us to order instead of just relying on the plated meal, so we got to taste Gerry's Grill Filipino dishes specialties like Kare-Kare, Crispy Pata, and Grilled Squid. Gerry's Grill x History Con Food and Restaurant Review? Lol! The afternoon ended with some freebies (shirt, notebook and pouch) and a groupfie with Jacque Ruby and Leslie (Bernadette Sembrano) Castaneda, and the bloggers. Watch our video coverage (three-parts video posted on Facebook) of the entire discussion led by Jacque Ruby, plus a special invite and shout-out with him.